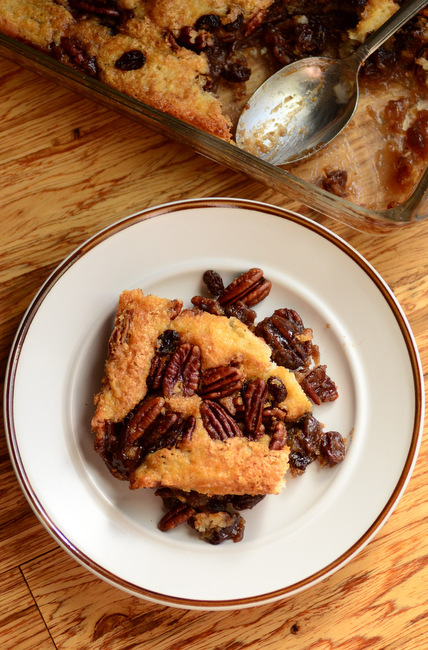 I make cobblers all year round, but they get baked even more often during the fall and winter, when I’m looking for comfort food dishes that can be serve while still warm from the oven. Most cobblers are made with fresh or frozen fruit, but this one is a little unusual because it uses nuts and dried fruit, instead. 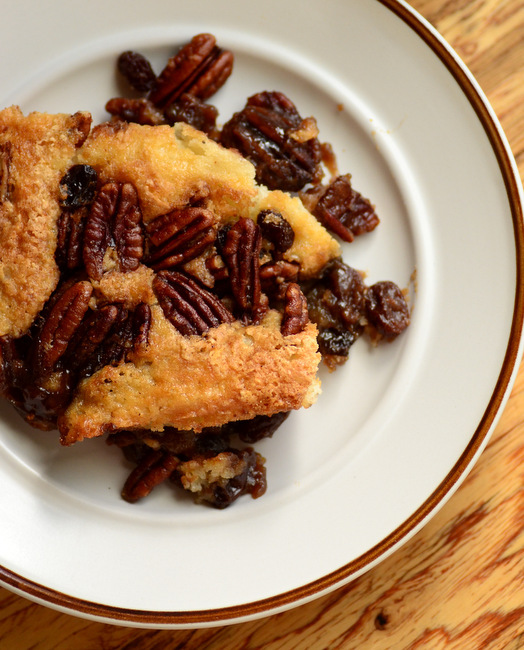 My Pecan and Raisin Cobbler is a perfect-for-fall dessert, filled with comforting flavors and easy enough that it only takes a few minutes to put together. Serve it warm with ice cream and it’s better than a traditional pecan pie for entertaining. The cobbler has an unusual method that starts by melting butter in the baking dish in the oven. Once the butter is hot and melted, the batter is poured straight into it, along with the rest of the dish’s ingredients. The method – which I saw for a Pecan Pie Cobbler in Taste of Home – is very similar to that of a pudding cake, a dish that separates into layers of sauce and cake as it bakes. The batter for the cobbler is very simple and contains no eggs. It is flavored with nutmeg and vanilla – both flavors that compliment pecans and raisins very well – though you could easily spice things up with cinnamon, cloves or other flavors for a little variety. The batter will start to cook almost as soon as you pour it into the hot butter, but there is still plenty of time to layer on the pecans, raisins and brown sugar before it has to go back into the oven. Some of the nuts and fruit will stick to the batter, while the rest of it will end up below the topping in the brown sugar sauce. I highly recommend using whole, toasted pecans for the best texture in the finished cobbler. Pecan pieces can be used, but try to use larger chunks rather than smaller ones. Once baked, the finished cobbler looks and smells amazing. It really does taste quite similar to pecan pie, thanks to all the nuts and the brown sugar sauce, but the raisins give it a unique sweetness that I happen to love. The cobbler should be serve when it is still warm. It is excellent on its own, but pairing it with a scoop of vanilla ice cream or a dollop of whipped cream will make it even more memorable. Preheat oven to 350F. Place butter in a 9×13-inch square baking pan and place in the oven. Allow butter to melt completely in the oven while you prepare the rest of the recipe. In a medium bowl, whisk together flour, sugar, baking powder, nutmeg and salt. Add in milk and vanilla extract and whisk until smooth. Remove the hot pan from the oven and pour batter as evenly as possible over the melted butter. Sprinkle pecan halves, raisins and brown sugar evenly over the top of the batter. Carefully pour hot water over the top. Bake for about 30 minutes, or until topping is browned and filling is thickly bubbling. This cobbler looks so delicious and perfect for Fall! When do you add the brown sugar? I already had the butter & batter in the pan when I discovered it sitting there, so I sprinkled it on top of the batter, before the nuts & raisins. Hope it comes out okay.